Product prices and availability are accurate as of 2019-04-09 06:25:49 EDT and are subject to change. Any price and availability information displayed on http://www.amazon.com/ at the time of purchase will apply to the purchase of this product. 592-DST Finish: Chrome Features: -1.50 gpm 6" psi, 5.7 L/min 414 kPa. -Rigid spout. -WaterSense certification promotes water conservation. Product Type: -Standard bathroom faucet. Country of Manufacture: -United States. Dimensions: -3.8'' O.D. straight, staggered pex supply tubes. 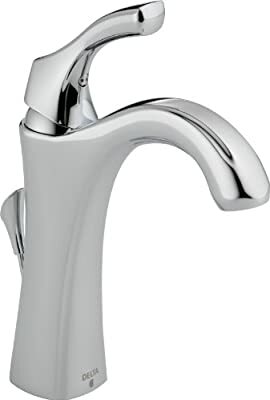 Overall Faucet Height: -10.25". Overall Faucet Width: -5.75". Overall Faucet Depth: -5.06". Spout Height: -10.25". Spout Reach: -5.0625". Overall Product Weight: -5.6 lbs. -Includes optional 5.75". escutcheon for 3 hole installations. Maximum Faucet Centers: -4". 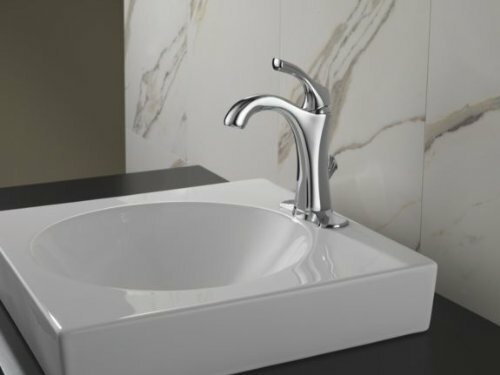 Featuring smooth, organic lines and a flared seashell motif from the Art Deco period, the Delta Addison single handle centerset lavatory faucet stylishly complements any bath--from traditional to modern--with its feminine and striking, high-arc spout silhouette. This model comes in a chrome finish, and it's also available in aged pewter, stainless steel, and Venetian bronze. The Addison collection also has coordinating accessories, including an 18-inch towel bar, 24-inch towel bar, towel ring, robe hook, and tissue holder to complete your bathroom. 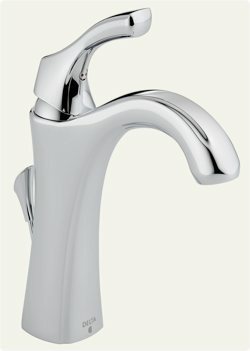 The Delta Addison single handle centerset lavatory faucet in chrome (view larger). 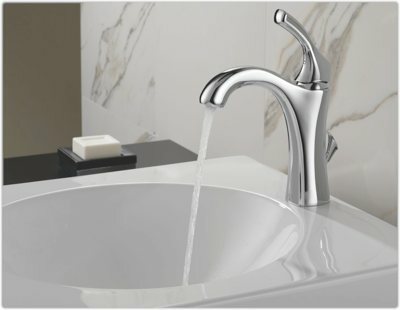 The Addison faucet features a Delta Diamond valve cartridge with InnoFlex waterways with PEX-C tubing, which combine to reduce the number of leak points, simplify installation, and provide long-lasting performance. The valve requires no lubrication, eliminates wear on seals, and ensures "like new" operation for the life of the faucet--up to 10 times longer than the industry standard. And the system ensures that once inside the faucet, water is not in contact with potential metal contaminants. The InnoFlex integrated supply lines can be connected directly to the hot and cold shut off valves, and no intermediate risers are needed. This single handle centerset lavatory faucet has a solid brass fabricated body, and it can be used with either a one- or three-hole mount (a 6-1/4-inch escutcheon plate is included). The spout measures 5-1/16-inch long, and it comes with two 3/8-inch O.D. straight, staggered pex supply tubes that measure 33 and 34 inches long. 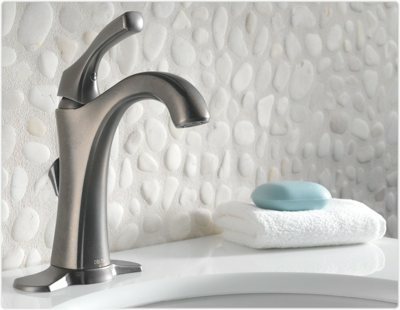 It's backed by Delta's 5-year limited warranty (on faucet and finish). Delta Faucet Company is committed to working with the EPA WaterSense program to encourage efficient use of water resources and actively protect the future of our nation's water supply. This Addison faucet has a maximum 1.5 gpm (gallons per minute) flowrate at 60 PSI (pounds-per-square-inch)--using 32 percent less water than comparable faucets. Includes optional escutcheon plate (aged pewter model shown; view larger). Graceful curves for a romantic touch to your bathroom (view larger).